I just spent the last hour or so going through pictures so I could send some special ones off to be developed. It’s the end of the year and time, I figured, to catch up on all of that. Get current on scrapbooks and get some holiday gift pics ready to frame and put in the mail. I really wasn’t expecting so much inspiration to come from this simple and tedious task. Looking back at early pictures of our days here, I am actually quite (and pleasantly) surprised to see the changes in my daughter, my family, myself, our horses. It has been exactly nine months today since we uprooted our lives and moved in here to the horse boarding/training and trail riding stables. In some ways it still feels so new, like we moved in yesterday. And in some ways it feels so old, like we’ve been here forever. I found myself pausing to think over these past months. The people, the horses, the growth, the huge leaps in learning, and the hard times. It has not all been slow and easy, no it hasn’t. As much as I would like to display that here, it wouldn’t be honest. It has been slow and hard going much of the time. In more ways than one. Then…I look at this picture I recently took of my little girl. My goodness. She went from a 5 year old traumatized rider from her first “FALL” to a girl riding confidently on a sweet old man named “Jack”, to being bucked off that sweet (but grumpy) old Jack. THEN, we moved in here. She persisted forward with a new fear of knowing the scare and pain of a buck. She perserved on with Jack and a couple more horses. 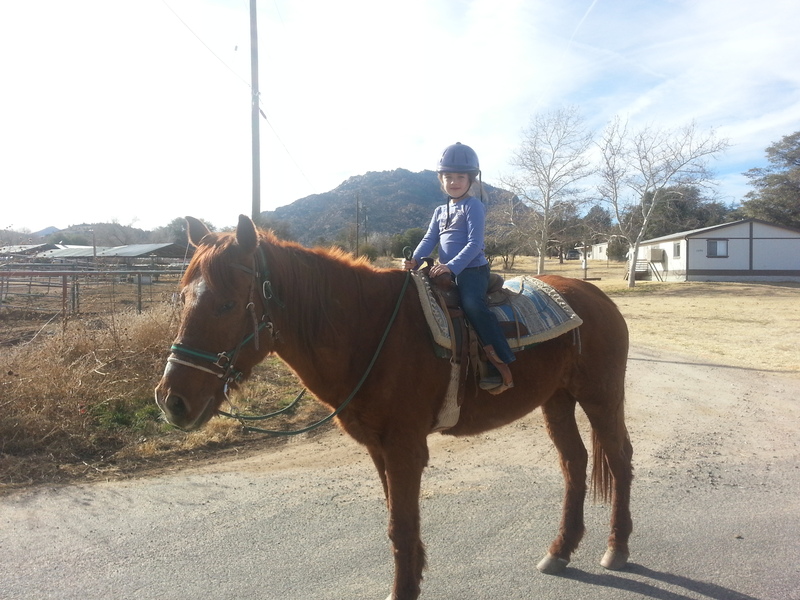 “Loosen your reins!” became my mantra and tighten them up further became her response. Then she got her lovely Arabian dream “Romance”. And, she proceeded to pull the you know what out of her mouth with tight reins and grasping the saddle and pure fear. Well, wouldn’t you know it but that lovely Romance RAN AWAY WITH HER in the round pen –first ride. Anyone out there working with lessons kids….you hear me. Nevermind the fact that she’s my own kid as well! We went downhill emotionally so far and so fast, I thought this little baby girl was never coming back up for some manure sweet air. Low and behold, she wanted more. I have never made her ride, she would come to me every morning begging to ride even while being scared to death to do it. So began the saga of little girl traumatized three too many times on three horses and mama teacher who (because of being mama) she just didn’t really respect. All she had to do was cry and say “Im scared” and what was one mama to do, really? Ok, “off you go”. Well, once, twice, three times, okay. BUT…there comes a time when….we just really need to RIDE. There were slow days of just groom her, tack up and walk her around the arena. Please. 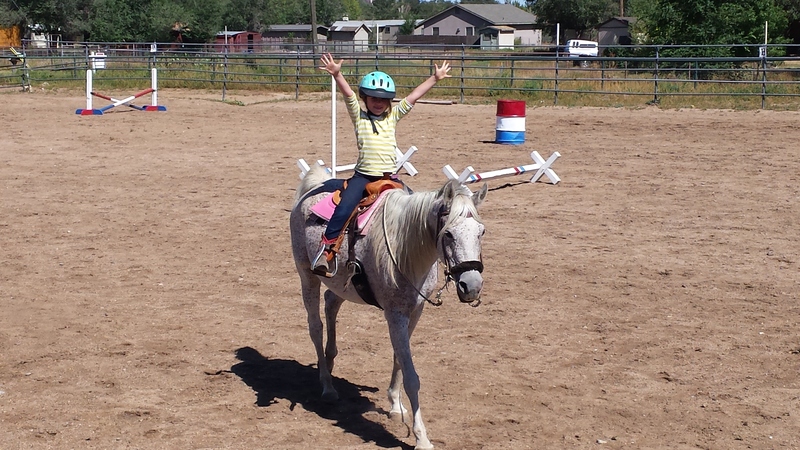 And, suddenly, with really no warning, my little girl said “I trust her” and dropped her reins. Put her hands out in the air and said “look, ma, no hands”. There was a little more work here that I’m perhaps leaving out, including putting trotting poles in her horse’s stall (she was petrified of them). I questioned myself over whether that was really the nicest thing, but decided that it was okay. The poles would not attack her in the middle of the night (I promise) and what better way really to get comfortable with something than to SLEEP with it. There were days of just watching while my girl did nothing but sit on her horse with her body tense and reins tight not wanting to move but also not wanting to get off (once it was for 45 minutes!). Times of biting my tongue and just trying not to look! Friends and other boarders offered encouragement to her along the way. Mostly it’s just been a lot of patience, time and space knowing that she wants this so bad and it will just come into being when the time is right. She has the skills, she knows how to ride, and she has the passion. Just give her time to heal. Well, I think her time has come. Maybe not completely. It’s a long journey for everyone and really doesn’t have a finish line. But this cowgirl is certainly more than along her way I tell you. Sweet, grumpy, old man Jack. This was my girl’s first real horse relationship and first real “cowgirl up” experience too. My how love hurts sometimes! Jack has also recently been one of her first “saying goodbye” and dealing with death experiences. Looking back at the words I wrote above, I see all the we learn and all that we become just by being around and working with horses. How horses can teach so many important life lessons amazes me. Thank you. I love your sunset pics by the way!